The Netherlands are well known for their 'totaalvoetbal'. The nation has won the European cup once in 1988 when they beat Russia 2-0 with goals of Gullit and Van Basten. The Dutch hold the record for playing the most World Cup finals without ever winning the final. They finished second in the 1974, 1978 and 2010 World Cups, losing to West Germany, Argentina and Spain respectively. Can Holland win the Nations League? 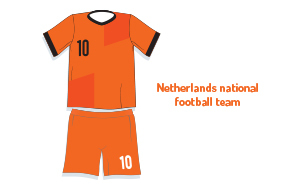 Book your tickets for the Netherlands national team to find out yourself!